Gary Slutkin, an epidemiologist and physician at the University of Illinois at Chicago, is treating violence like an infection. Stop its transmission; get at the highest risk cases. And he’s doing that by acting like an anthropologist, using experiences and ideas culled from years working on public health projects in immigrant communities in the United States and in several countries in sub-Saharan Africa. I just wish more anthropologists would act like him! CeaseFire, a Chicago-based violence prevention program started by Slutkin, was featured in the New York Times Magazine yesterday, covered by Alex Kotlowitz in his excellent “Blocking the Transmission of Violence.” Kotlowitz focuses on the core feature that makes CeaseFire a different sort of program: the use of “violence interrupters.” These are men who have been through the streets, who have the contacts and know the code. They are men like Zale Hoddenbach, thirty eight, once active in gangs, then eight years in prison, now a fervent interrupter. These “hardened types” form the core of CeaseFire, living proof of change as well as men who can go places and talk to people that no public health PhD could ever imagine doing. So why do I say he’s an anthropologist? Three reasons, really. 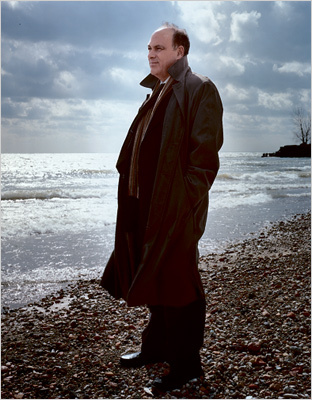 First, Slutkin is critical of received ideas, in this case that punishment drives behavior: “He was convinced that longer sentences and more police officers had made little difference… ‘Copying and modeling and the social expectations of your peers is what drives your behavior’.” He sees this approach as more akin to stigmatization and moral punishment than effective policy: people are afraid, so they turn to old reactions “like putting people away, closing the place down, pushing the people out of town.” This combination of a critical cultural take on present practices, and an informed social perspective, makes his approach inherently anthropological. Second, Slutkin approaches problems as a participant observer, stressing the value of inside knowledge, relationships built on trust and rapport, and the importance of language. The twist is that the violence interrupters are the ones who do this sort of work. They are the local experts, the ones who spend the time on the streets. They are the anthropological advocates. Third, Slutkin places violence in the context of the inequality and culture that shape people’s everyday lives.—the street code, the things happening off the radar, the way one act of enmity spirals into another, the mix of desperation and reputation that fuels violence. Kotlowitz portrays these well in his article. Nevertheless, Gary Slutkin is still a doctor and a public health guru. Like Paul Farmer, Slutkin wants to do something, not just participant observe and then pack all those insights into a book critical of everything, including the ability to help. Doing means trying out ideas and seeing what works. Doing means using a public health model based on the prevention of problems. Neither of these—knowledge how and models for change—are particular strengths of anthropology. There are historical reasons about anthropology’s ambivalence towards making a difference. Anthropology remains the relativist’s delight, a place to understand things from the other’s point of view, and relativism is a shaky place on which to make moral stands. Anthropologists are often interested in cultural and historical forms, in reading culture and ideologies like texts—a significant remove from the hardships of people’s lives, especially when ensconced in an Ivory Tower. And we’ve had our fair share of imperialist failures, starting with working for colonial powers. More recently, given our backgrounds, we often impose our ideas, however benevolent and western, on other people when we set out to help. And, despite our best intentions, our small status in the academic and policy field has often meant that our work gets co-opted by bigger institutions, such as the military and international development organizations. But there are anthropologists who do work similar to Gary Slutkin. Paul Farmer, besides mixing anthropology and human rights, has pioneered with his group Partners in Health the use of community health workers in low-resource settings like Haiti and Peru. Tom Weisner recently outlined his anti-poverty work, in conjunction with the New Hope Project in Milwaukee. Mark Edberg, alongside his ethnographic work on violence, has initiated a community-based anti-violence program that looks to stop things before they get started. Getting at the problem before the fact, rather than after the fact as Kotlowitz characterizes CeaseFire. There is also a Society for Applied Anthropology, as well as a Society for Medical Anthropology. However, both are professional academic organizations, rather than highlighting our limited how-to knowledge to complement anthropological knowledge about particular problems. Slutkin’s work is by no means perfect. His comparison of violence prevention to smoking prevention shows this. Public health warnings, effective laws focused on second-hand smoke and public spaces, and increasing social stigmatization all helped drive smoking rates down in the United States. US smokers today are, by and large, a group little affected by those three measures. They are generally people who got hooked early, and who grew up in difficult circumstances and now occupy social spaces where smoking is tolerated while they face more pressing problems than a slight wheeze. George Kelling, of “broken windows” fame, makes the point that “a public health model will be fully effective only if coupled with other efforts, including more creative policing and efforts to get gang members back to school or work.” The need for gun control measures are also mentioned, as well as programs to get at associated risk factors like alcohol and drug use. That combination of a person’s identity (whip their asses), a cultural ideal (wherever it went), and that neuroanthropological mix of emotions and thoughts (those old feelings) show us how difficult behavioral problems can be. Anthropology has not made a tradition out of studying the sequences of behaviors, feelings and rituals that go into shaping particular outcomes. Culture and inequality have been assumed to account for such things, for example, a culture of honor or structural inequality leading to violence. These cross-sectional models don’t help us understand change, how one thing leads to another. Works that get us closer to the personal nature of violence include Daniel Linger’s analysis of how suddenly a fight erupts at a Brazilian bus stop and Brain Ferguson’s take on why the Yanomami make war. Both those articles could be placed in the larger context that Carolyn Nordstrom describes in A Different Kind of War Story. But that’s back to analysis. Which brings me again to what Slutkin does, rather than says. He uses CeaseFire’s violence interrupters, the local advocates who can talk the talk and walk the walk. He focuses on breaking a chain of behaviors, on avoiding retaliation and escalation, and not simply on the meaning or the tragedy. His approach is participatory and community-based, for action as well as for understanding. Anthropologists are looking for that knock-out blow, the ringing critique that will knock the wind out of the powers of oppression. It’s just not very effective coming from a white tower. In the ring, we need to lead with the jab, again and again, the constant work to keep an opponent like violence from taking care of its own business. The how-to jab and the power punch, that’s a good combination. This entry was posted in Applied Anthropology, Violence. Bookmark the permalink. Borko Jovanovic, PhD at Northwestern University forward your article to me, after learning that I chose youth violence as a project for a Health Behavior Class. I read your article and I found it very interesting to learn that you faced obstacle too, working with behavior and language barrier. I have many questions starting with what determines exactly how to address violence and once you realize it does not work. Do you modify your program after so many attempts? Also, have you researched Chicago south side neighborhoods particularly Engelwood and Roseland communities? If it is not a bother, I just want to know exactly what direction of behavior model should I follow that will explain and demonstrate a change in behavior of violence among youth and quality of life?